The number of bullets denotes the number of editions defined by the artist himself. : blue bullet, edition available for sale founded or to be founded. : red bullet, edition already sold. This piece of work is already in your basket. If you choose to add it, it will automatically change the quantity. (Countries differences in VAT rates require as many invoices as expedition points). If you choose to add this piece of work to your basket, it will automatically replace the existing piece unless if it made by the same artist. (Countries differences in VAT rates require as many invoices as expedition points). 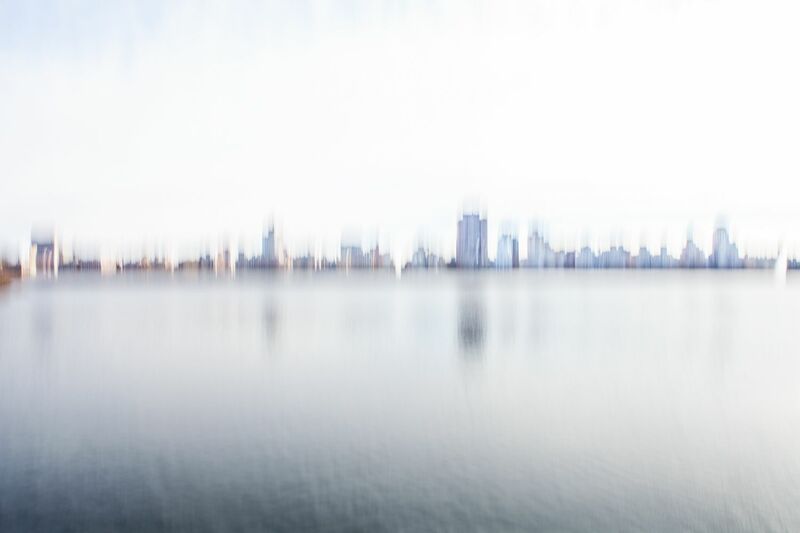 New York Dream 08 is a photograph by contemporary artist Xavier Dumoulin taken from the series «New York Dream». In this series, this nature lover confronts, somewhere between fascination and dread, the skyscraper jungle of this American megacity, "The city that doesn't sleep" with its ever-changing face, that generations of photographers before him have tried to capture. What makes Xavier Dumoulin's work unique revolves around his "bougé volontaire," a blurring treatment which helps to bring out the verticals, the height and the perspectives of the skyscrapers "like an impression left after a dream." The artist is looking to grasp the essence of these urban landscapes by abstraction. In this photograph the buildings seem to rise up out of the water creating a mirage-like skyline which stands out against the white of the sky and the river.